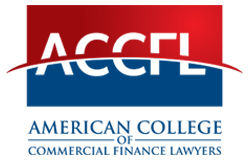 The American College of Commercial Finance Lawyers is a professional organization dedicated to promoting the field of commercial finance law through education, legislative reform and the recognition of distinguished practitioners, jurists and academics. The College offers a venue to promote and recognize outstanding achievement and advances in the field of commercial finance law. The American College of Commercial Finance Lawyers, Inc. (the College) is a professional organization founded in 1991 and dedicated to promoting the field of commercial finance law through education, legislative reform and the recognition of distinguished practitioners, jurists and academics. The College’s mission is to bring together into an association those highly qualified members of the legal profession who, by reason of their character, skill and ability, will contribute to the goals, accomplishments and good fellowship of the College. Additional information about the College is available at https://www.accfl.com. Each year College Fellows gather for their Annual Meeting & Dinner where they are updated on the business of the College. This year, the event was held in Vancouver, BC, Canada. The 2023 Class of members of the Board of Regents was voted upon, the 2019-2020 Executive Committee was introduced, Fellows E. Carolan Berkeley and Sandra M. Rocks were honored for their achievements with the College's 2019 Homer Kripke Achievement Award , and twelve new Fellows were inducted into the College. More information can be found on the College Activities page. The College's 2019 Fall Dinner & Advanced Seminar will be held in Washington, D.C. Fellows, mark your calendars and make your hotel and plane reservations. Registration materials will be sent to Fellows by email during the summer.. Watch your inbox! Click here to access information about the College’s Observer Briefing Calls for Fellows. Notices for the College's 2019 dues were distributed in early December 2018. These dues support the ACCFL services and activities during the 2019 calendar year. If you are a current Fellow and do not have Emeritus, Judicial, or Academic status and did not yet pay your 2019 dues, please pay at your earliest convenience, or contact our administrative office at [email protected] and we will be happy to assist you. Congratulations to ACCFL Fellows' on recent outstanding achievements! Fellow Melissa Jacoby is bankruptcy professor at University of North Carolina Chapel Hill, and was quoted in an article in USA TODAY, published on January 31, 2019. It can be found at this link. Melissa comments on the importance of determining the best interest of stakeholders in the Sears bankruptcy case. Melissa also appeared in the Wall Street Journal article reflecting on California PG&E’s bankruptcy filing and reorganization. Here is the link to that article. Widener University Commonwealth Law School announced on July 19, 2018 that ACCFL Fellow and Commonwealth Professor of Business Law Juliet Moringiello has been named Associate Dean for Research and Faculty Development. Here is a link to more information. ACCFL Fellow Leonard H. Gilbert (Holland & Knight, Tampa, FL) was honored with the Barbara Hancock Literacy Award presented by The Hillsborough County Literacy Association on May 14, 2018. He was also presented with the Celebrate Literacy Award by the International Literacy Association. It is with pride that the College congratulates Leonard for the committment of time and energy that underlies these awards. Engaging youngsters through reading activities and books is certainly a laudable activity that can alter the future for many children. Here is a link to Holland & Knight's press release. The Equipment Leasing and Finance Association (ELFA) awarded Stewart G. Abramson and ACCFL Fellow Dominic A. Liberatore, deputy general counsel at DLL, the Edward A. Groobert Award for Legal Excellence on May 7 at the ELFA Legal Forum in Washington, D.C. Here is a link to the press release. The College is proud to announce that ACCFL Fellow Honorable Mindy A. Mora was appointed for fourteen (14) years as a bankruptcy judge for the Southern District of Florida, West Palm Beach Division, on April 6, 2018. The appointment was by the Eleventh Circuit Court of Appeals. Here is a link to a press release about the appointment. The American College of Commercial Finance Lawyers was founded a quarter century ago, through the foresight, insight and perseverance of our co-founders Maury Poscover, David Willenzik and Earnest Bland Williams III. Over the succeeding years, this College has inducted nearly 300 preeminent practitioners and scholars as Fellows and has firmly established itself not only as a prominent honorary society of remarkable collegiality, but importantly also as a learned, active and influential participant in the field of commercial finance law. And now, through the labors and invaluable recollections of many, the history of the College has now been written and is available for your enjoyment. Please click here to read the History of the American College of Commercial Finance Lawyers online or to download a copy. The College's 2019 Annual Meeting & Dinner was held at the Vancouver Club in Vancouver, B.C., Canada on March 30th. The Fellows gathered for their annual College business meeting and a sensational dinner, inducted 12 new Fellows, elected new Fellows to the Board of Regents, and presented the College's Homer Kripke Achievement Award. Please click here for further details. The College's 2018 Fall Dinner was held on Saturday, September 15th at Lambert's Downtown Barbecue. The evening's food, ambiance and collegiality transformed a pleasant event into a dynamic and delightful evening for all! The College's Advanced Seminar, held on Sunday, September 16th at Winstead, PC was as enjoyable as it was educational. Fellow Prof. Stephen Sepinuck's seminar lived up to expectations, challenging attendees throughout the morning - causing fellows to be even more grateful for Winstead's sponsorship. The seminar was held Winstead's Austin office, with a delicious, nourishing breakfast served that kept attendees going all morning long! Please click here for further details.